At Meets a variety of activities may take place, with groups of members deciding their own options after general discussion of weather and conditions. Some members rock climb to a high standard, others prefer mountain routes and scrambling. Experience contributes to winter activities. Recognise the views .... see video opposite (or lower down for some mobile phone users). Over the years the Club has had a variety of Alpine meets. This summer we were at Saas Grund. Initial acclimatisation included; walking to the Britannia Hut, up to Hohsaas 4,000 m peak trail, the Jegihorn klettersteig - all over 300 m, and some cragging at Zum Kapellenweg. Then routes included: the walk/scramble to the Mischabel Hut for the Ulrichshorn (3925m); the traverse of the Weissmies (4023m) in perfect conditions; towards the Allalinhorn (4027m) by the Hohlaub glacier and back to Britannia Hut; another klettersteig on the Mittaghorn added to the fun. A later trip to Allalinhorn summit. In-between, some multi-pitch routes near SAAS Almagell; walked nature trails; cragged at the amazing Feechi gorge only 10 minutes walk from the campsite; and 2 who had bikes did cycle runs. Enjoyed by members, prospective members and friends alike. Various hills climbed in snow conditions on Friday by members 'on the way' north. Saturday, two members set off for a Graham on the Trotternish ridge and enjoyed the views. A larger group traversed over Belig to Garbh-bheinn with mixed rock and hard snow, crampons essential. While two others investigated ice climbing conditions. On the Sunday, a group traversed Glamaig from the north meeting others coming up over Beinn Dearg Mhor. Two members climbed up to Sgurr nan Gillean with its interesting 'mixed rock and snow' scramble to the summit. Three ice climbers went up Nicholson Chimney (III, alt leads) W ridge to Sgurr nan Gillean and down via SE Ridge returning in the dark, see photo to right (or below for mobile phone screen). A great Easter Meet. On the Sat a group of five climbed Stob Coire Sgreamhach via Lairig Eilde and up Sron na Laraig. Other members headed for: Inglis Clark Ridge (III). On Sunday various groups/individual went on climbs or on other hills. 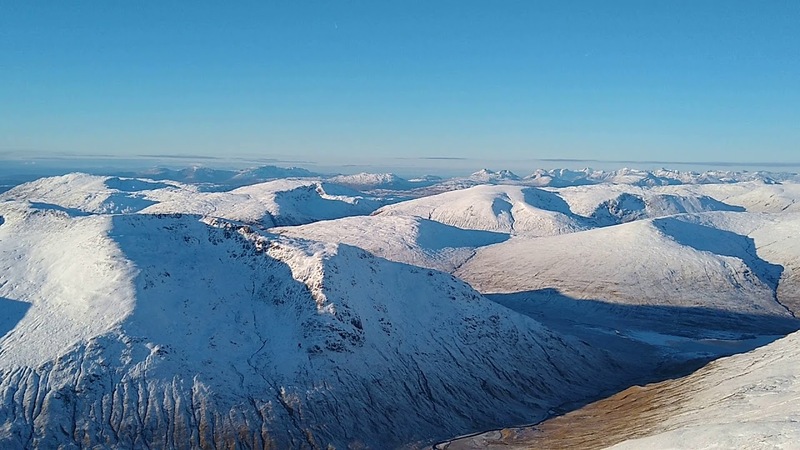 On Friday two members tackled Baosbheinn, while another went up Beinn Airigh Charr, with a river crossing giving pause for thought - but where there is a will there is a way! Three others went in search of rock to climb, eventuall climbing Neptune’s Wall at Slaggan (Gob a’ Gheodha). More members arrived on Friday night. On Saturday a keen climbing party set out for Slaggan cliffs (at Gob a’ Gheodha) again, this time by the lovely walk in from Mellon Charles. Five climbed all day in glorious sunshine at Atlantic Avenue and had a go at anything between Diff and E1 (the former soloed, the latter on a toprope, and the in between in the usual manner). Those who had long walks on Friday opted for a gentler time, and walked over from Slaggan along the track from Laide spending the afternoon sunbathing and watching the climbers. The icing on the cake (for some) was a swim at Slaggan Bay. On Sunday with indifferent weather again, some made an ascent of Meall a’Ghiubhais. While others set off for the through walk from Gruinard Bay to Loch na Sealga and back along the Gruinard River. Though two managed a few routes at Jetty Buttress. Members arrived on the afternoon of a heat wave at 26 C, so opted for a cooler late pm walk to Barkeval to view the Rum Cullin ridge, (below left). The next day showers were due early pm so shorter excursions were made to interesting hills or bays. Sunday was misty but due to clear, hence it was off to the Rum Cullin ridge. Atmospheric towards Askival (above) but then clear. On over Trollaval’s rocky twin tops (below L) to Anshival and superb views (below R). That just left the final shoulder and undulating walk out of over three hours in a glorious evening! Two keen members (below R) continued down to bivy near the shore. Monday lacked sunshine for sociable morning activities before the afternoon boat back to the mainland after a superb w/e. Come along on lots of meets and get to know members. There is so much history in the club and lots of really interesting people with great stories to tell. I've found everyone in the club really welcoming, so hopefully you will too.